There are many methods for determining your percent body fat. Some methods used to measure your percent body fat are simple, easy ways which you can do at home by yourself. On the other hand, some body fat measurement methods require a professional to administer the test and others even require expensive equipment. An important thing to remember is that all methods used to measure body fat are in fact estimates. They accurately estimate your percent body fat based on equations which are derived from past scientific studies. How close the measurement is to the expected value. If a measurement is accurate it will produce results which are expected based on past data, or the accepted standard. How consistent the measurements are. If a measurement is accurate 1 out of 10 times, it probably is not the best way to estimate your body fat percentage. Does the measurement method actually determine what you aim to measure for? Methods which are not invasive may require just a few seconds of your time. Body fat measurements can sometimes be invasive. They may require you to wear minimal clothes, be submerged in water or be pinched by calipers. Which method is right for you depends on the accuracy you desire, if you’re comfortable with the method, the time you have available, and your budget. What are Some of the Various Body Fat Measurement Methods? If your exercise and nutrition regimen causes your clothes to loosen up, it is a good sign you are losing body fat. If you lose weight, you can keep the old clothes as a reminder of how much better you feel after losing it. A form of Anthropometric measurement, body circumferences can be used in formulas to estimate percent body fat. Equations which you can plug in your circumferences for a body fat estimation are all based on a statistical model. Years ago a sample of the general population’s cadavers was selected and analyzed to determine the equations which we use present day. If you are losing inches you are most likely losing body fat. It is important to measure multiple parts of your body. I highly recommend you purchase a quality body tape measure such as this one here. If you take circumference measurements make sure to measure the exact same location each time. The most important circumferences to take are the waist and hip. The waist : hip ratio is an important indicator of general health. A waist : hip ratio for men under .9 and women under .7 is considered healthy. 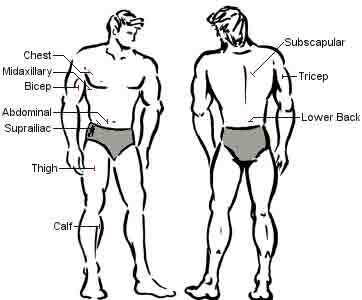 Other common body parts to take circumference measurements are the calves, thighs, arms, neck, forearms and chest. Remember when taking circumference measurements to always take the measurement during the same time. For example, you do not want to take your waist circumference measurement after thanksgiving dinner. Circumferences are always a good idea to accompany a body fat measurement which accurately estimates your body fat percentage. BIA stands for Bioelectrical Impedance Analysis. BIA uses a small electrical current which is passed through your body. The common methods to apply BIA is with a body fat scale and handheld body fat analyzer. The current is impeded by the level of body fat. The machine assumes your LBM or Lean Body Mass is mostly water which conducts the current better than fat. The basic idea is the current will take longer to reach the other side of the circuit which is either a hand or foot. The internal computer takes care of the computing of the equations. The BIA method is not all about body fat because it can also estimate total body water. BIA can give an accurate measurement under certain situations. Since the equation is based on normal conditions. Being dehydrated can effect the measurement. Alcohol and caffeine ingestion during the previous 24 hours prior to measurement can also effect the accuracy of the measurement. Previously being in a hot, humid environment or just taking a shower can also effect the body fat measurement. Certain people such as elderly, highly active athletes and people from various ethnic backgrounds tend to get inaccurate readings from most BIA machines. The advantages of using BIA is it is completely invasive and takes seconds to perform. You can also perform the test on yourself. They are also relatively inexpensive. To get the most accurate measurement it is best to take the measurement under the same conditions every time such as after waking up in the morning. The great thing about the Accu-Measure body fat analysis is that it is very fast and easy. All you have do is measure one skinfold above your right hip bone and consult a chart which estimates your body fat percentage. Skinfold analysis accuracy depends on the number of sites used and complexity of the equation. Using only a single site will lower the accuracy but the ease of use makes up for it. To take a skinfold, all you have to do is pinch the skin with two fingers, pull it away from the body and apply the caliper with slight pressure until the little lever clicks. To get an accurate measurement, make sure to pinch as much skin as you can. 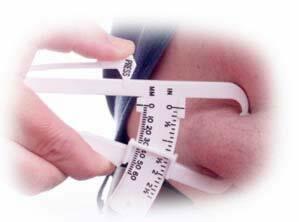 Click here to purchase an Accu-Measure body fat tester. Skinfold analysis has long been the most common and popular method for measuring body fat. Unlike the accu-measure which you can perform on yourself. Multiple site skinfold analysis takes a practitioner. Most personal trainers are familiar and experienced with taking skinfold measurements. 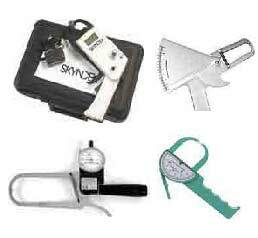 Skinfold measurements are made using skinfold calipers. Skinfold calipers range from $10 – $600. The most common skinfold calipers are the Lange (green). Each skinfold is taken by the practitioner, pinching and pulling lightly on a section of skin and placing the calipers over it to measure. The accuracy of skinfold measurement has usually been reported to be within 1-2% of the clinical standard (hydrostatic weighing.) The accuracy depends on the test subject and the practitioner’s skills and experience. 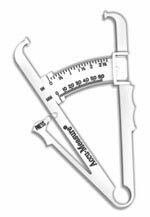 Click here to purchase a quality skinfold caliper. The first four skinfold sites are used in the most common method of body fat analysis which uses the Durnin and Wormsley formula. This method is less evasive. This is important because it is less likely to cause an awkward situation between trainer and client. It also takes less time and is almost as accurate as the other common 7 site Jackson and Pollack formula leaving out only the biceps from the above list. Hydrostatic or underwater weighing has long been the golden standard for measuring body fat. Hydrostatic weighing estimates the average density of the body. Body density is determined by dividing the total mass (weight) of the body and dividing it by the total volume. Body volume is determined by placing the subject under water and measuring the displacement of the known volume of water in a tank or pool. The test subject is completely submerged in the water wearing minimal clothing and is required to exhale all the air out of their lungs. This is quite invasive and inconvenient and can cost anywhere from $20-$75. If the test is performed properly it is very accurate. To properly perform the test it takes a skilled, experienced individual. If you want to have your body fat tested with hydrostatic weighing the best place to look is your local university. 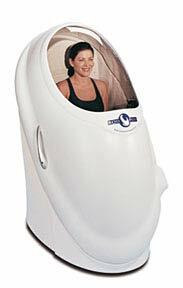 The Bod Pod uses air displacement lethysmography to estimate how much body fat you have. This principle is similar to the hydrostatic weighing method, but measures the amount of air your body displaces instead of water. The accuracy of this method is argued to be one of the best. To get a reading requires you to sit motionless in the space ship looking Bod Pod for around 5 minutes. To get an accurate reading it is important to wear minimal clothing. This is because your clothes and even your hair can trap air which will interfere with an accurate measurement. To get a Bod Pod measurement you can expect to pay around $20 if you can find one. If you are interested in a Bod Pod, a good place to look is your local university. Dual X-ray Absorptiometry (DXA) is the the most expensive way of determining how much body fat you have. It is also one of the most accurate and definitely the coolest. After you complete the scan you get a x-ray which literally shows how much body fat you have. The scan is very easy and non-evasive. You can wear normal clothes without any metal on them and lie motionless on the very expensive machine for up to 10 minutes. The DXA is not all about body fat. It is used for measuring bone mass primarily for osteoporosis patients. This makes DXA a 3 compartment analysis. It accurately estimates your bone mass, fat mass, and lean body mass. All other methods of determining your body fat are 2 compartment analysis which estimate your fat mass and lean body mass. DXA scans are the most expensive and probably the best way of body fat measurement to determine your body fat percentage. The average cost of a DXA scan is around $200 which may or may not be worth it. If you have had your body fat measured and you know your percent body fat, what does this mean? Learn what how you can use your percent body fat to create an exercise program to achieve your goals. Confused about how much body fat is bad? 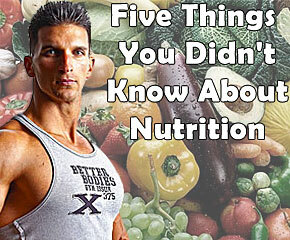 Learn what the average percent body fat is among the majority of people. If your aim is to reduce your body fat, the most direct method will be cardiovascular exercise. 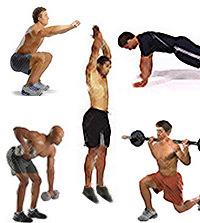 Learn which exercises are most effective and how to perform them to achieve your goals.